A family-owned business in Girona, Caganer.com, is becoming more and more well known for its caganers! 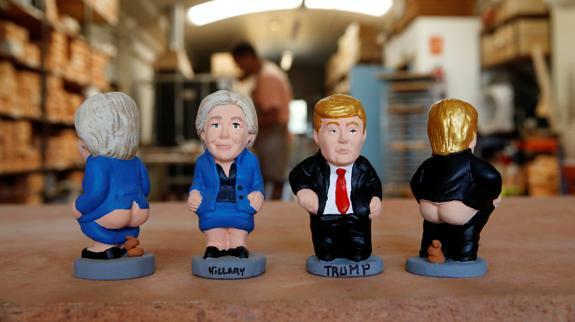 In fact, all manner of politicians, sports stars and celebrities are now given the dubious honour of being turned into a ‘caganer’. Here are a few more. Do you recognise them? 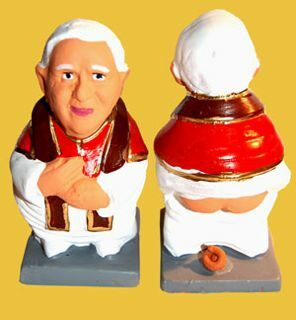 The caganer, (the pooper!!) is a small statue, usually of a Catalonian peasant, wearing traditional red stocking hat (a barretina,) or more often these days, a well known personality. He or she sits with trousers half down, in a “toilet” position, making his small contribution to the land, often smoking a pipe or reading a newspaper! The exact origin of the Caganer has been lost over the years but the tradition is known to have existed since the 17th century. Some say that he is “fertilising” the land to ensure a bumper crop the following year, others that he represents equality of all people (we all do it!) !! He will usually be found crouching in a corner in the Pessebre, the representation of the Nativity Story, adding a rather comical aspect to this traditional scene, and providing fun for the children as they try to spot him. There was actually a well supported ‘Salvem el caganer’ (Save the caganer) campaign in Barcelona when the council did not include a Caganer in the public nativity scene. The Caganer is one of a type of small figures called ‘santons’ (coming from the Provençal santoun or “little saint”) which became popular after the French Revolution of 1789 when churches were closed and Nativity scenes were banned. They gave a chance to ordinary people to “bring religion home” by setting up crèches in their own homes, a tradition previously reserved for the rich. The most famous santons portray common Provençal folk in 18th and 19th century clothes who visit the Holy Family and bring presents.